Sure, good things happen, sometimes beautiful things. But tragic things happen too. What does it mean? We find ourselves in the middle of a story that is sometimes wonderful, sometimes awful, usually a confusing mixture of both, and we haven't a clue how to make sense of it all. No wonder we keep losing heart. For when we were born, we were born into the midst of a great story begun before the dawn of time. A story of adventure, of risk and loss, heroism . . . and betrayal. A story where good is warring against evil, danger lurks around every corner, and glorious deeds wait to be done. Think of all those stories you've ever loved--there's a reason they stirred your heart. They've been trying to tell you about the true Epic ever since you were young. This dramatic retelling of the gospel, the core message of best-selling author John Eldredge, illuminates the unique role we can play in the amazing story God is telling. 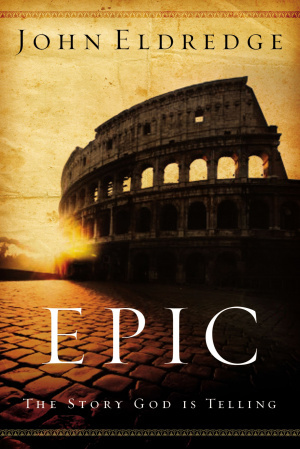 Epic by John Eldredge was published by Thomas Nelson in March 2007 and is our 5906th best seller. The ISBN for Epic is 9780785288794. Be the first to review Epic! Got a question? No problem! Just click here to ask us about Epic. Is a discount available when multiple copies of Epic are purchased? A:No further discount is available on Epic as this title is already on offer and is priced at the lowest possible cost.